I think I’ve been converted. I used to own a Blackberry but switched to an iPhone when I lost my Bold. And I’m loving it. 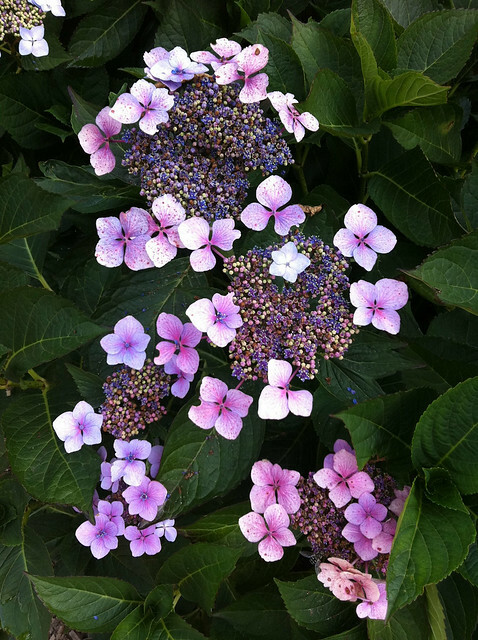 From the garden at the Carmelite monastery in Lisieux, France (where St. Therese’s remains lay): the Million Flower (that’s what I was told it was called), uh, flower. It was one of those days (yes, it happened more than once) when I left my memory card in my computer. 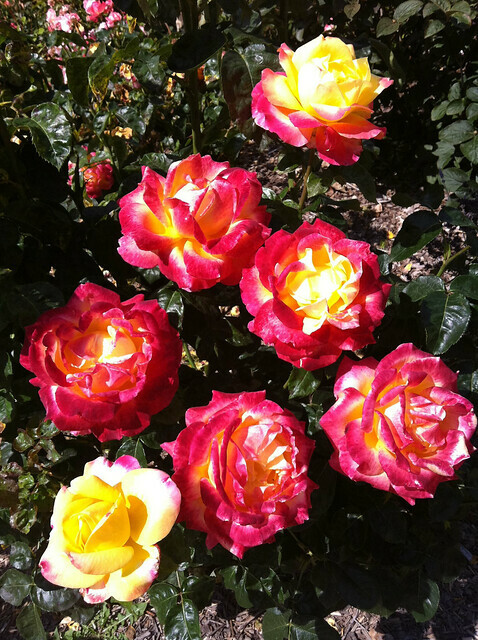 But the flowers in the garden were so pretty, I had to take photos. And these flowers and this photo are my favorite of the lot. I was really surprised how the iPhone camera captured the detail: the veins on the leaves, the teeny-tiny blossoms and the even tinier specks on the bigger flowers. The photo’s so good, it doesn’t look like it was taken from real life. And although I know some real artists and photography enthusiasts scoff at the app Instagram, I think it’s a lot of fun. It’s real easy to use and is a great help for those of us who want to tinker with the look and feel of our photos but don’t have the time/money/skill/patience to take photos on film or edit digital ones themselves. 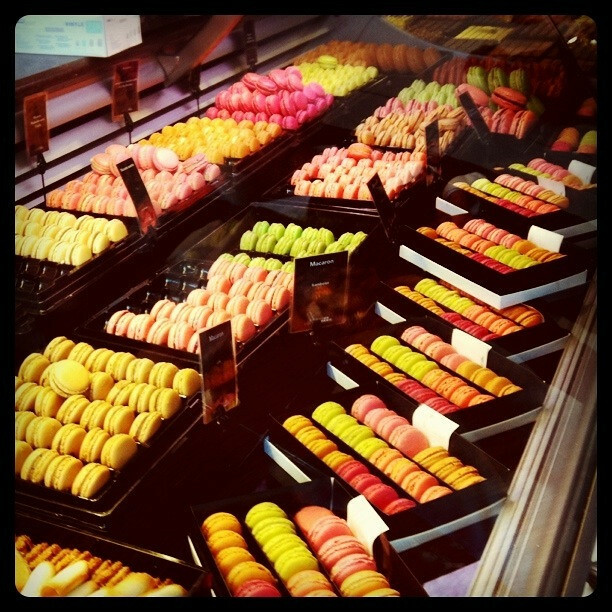 The macaron display case at the la Grande Épicerie. I had to take this stolen shot with my iPhone because photos aren’t allowed inside the store. 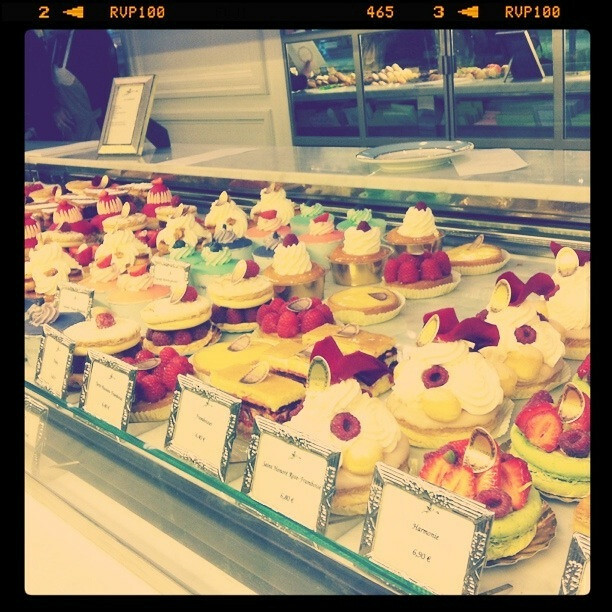 Another stolen shot of another pastry case, this time, Ladurée at Rue Royale. 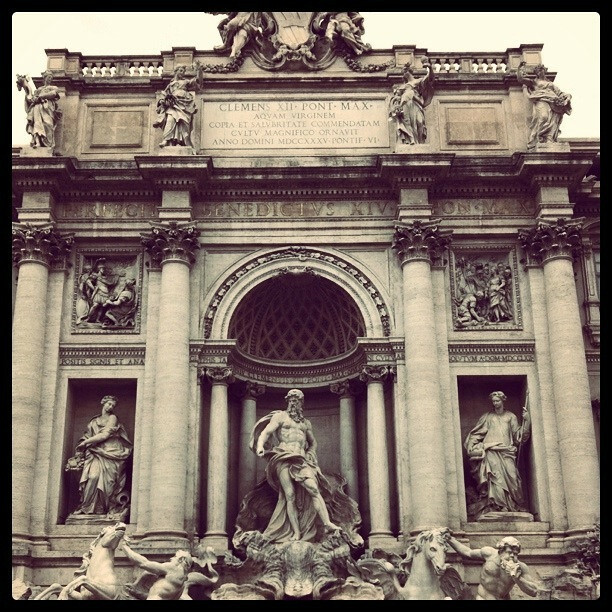 I threw a 5-peso coin into the Trevi Fountain the first time I was in Rome. And ta-da! I got to go back. But I forgot to throw another one in this time around. Oooops. Obviously I had fun with my iPhone and tinkering with Instagram during my trip. Instagram, I think, is great way to sort of have a different version a memory of a moment or place , to give a photo a feel that an un-Instagrammed photo can’t capture. And besides, when the photos are as yummy-looking as this one, don’t you want as many versions of it as possible? PS: You can follow me on Instagram: tightsarntpants. PPS: You can see more of the photos from my trip by clicking on the link to my Flickr account, which could be found on the right sidebar. I’ve saved the best for last. It’s my favorite flavor of them all: caramel. Not just any caramel, though, but Caramel au beurre salé. Caramel with salted butter. The contrast of salty and sweet… gaaaaaaaaaah… I don’t even know how to describe it and do it justice. But it is seriously one of the best flavor combinations in the world. 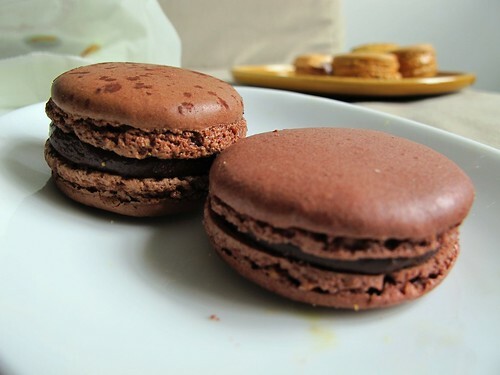 But which among the Parisian patisseries makes the caramel macaron I’m willing to travel across Paris for? Scratch that, a macaron I’m willing to travel across the WORLD for. Who made the macaron I took home from Paris to Manila, whose filling I unashamedly licked off the box? Not directly of course, I used my finger. Is this what heaven is made of? I sure hope so. Well, not La Grande Épicerie’s. Their caramel macaron was the most disappointing of the lot. The filling was thin and runny, the flavor of which was overpowered by the cookie, which was just too sweet. No such problems with Ladurée’s macaron, though. 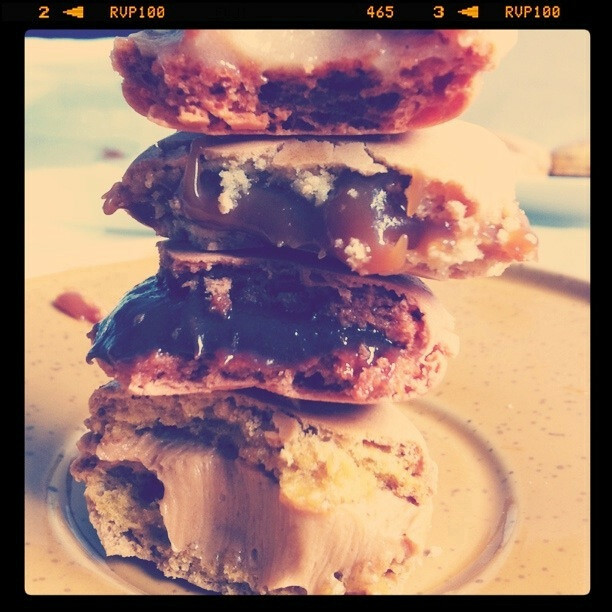 The opposite of thin and runny, their filling was the closest to traditional caramel: gooey, thick and sticky. I mean, look at the photo. And it tastes the closest to traditional caramel, too. Sweet and almost syrupy, but not overly so, as the French abhor anything that is saccharine-sweet. The sweet is balanced out by a hint of saltiness, but for me, not enough of it. I need more of that contrast, a heavier hand with the salt for this particular macaron to take me to gastronomic heaven. So while this macaron is a VERY good caramel macaron, it’s just not a good enough caramel AND salted butter macaron. 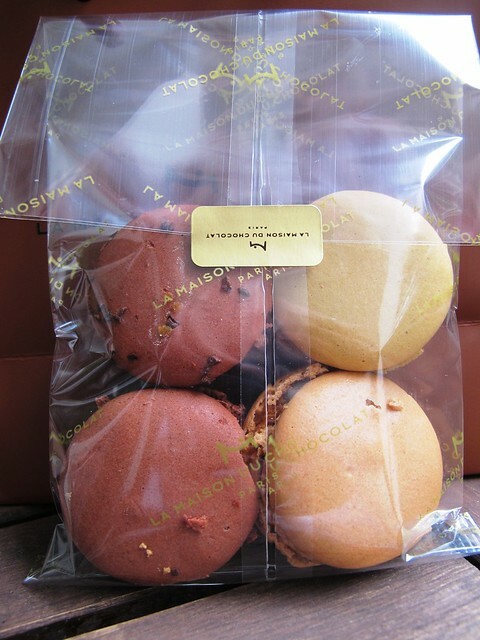 Especially when compared to the last two on the list: Pierre Hermé and La Maison du Chocolat. I know I said that caramel and salted butter is one of the best flavor combinations in the world. Well, La Maison du Chocolat, the same people behind my beloved Rigoletto chocolate, thought they could make it even more drool-worthy by adding another layer of flavor: bitter chocolate. And they were right. So, so, so, soooooooo right. And unlike their vanilla-chocolate macaron, where the chocolate took the limelight from vanilla, the caramel and salted butter is still the star of the show in the Rigoletto macaron. Apart from the color of the filling, I wouldn’t have immediately guessed that it was chocolate that gave the filling that subtle hint of bitterness. If I didn’t know, I would’ve thought that they took the caramel to almost burning point, but the quality of the bitterness was different. Deep and smooth, not sharp and jarring. 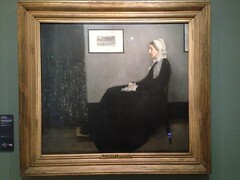 Bitter, sweet, and salty all complementing each other. *droooooooool* Chocolate DOES make everything better. But as much as I would like to go on and on an on about La Maison du Chocolat (I kinda did already), there’s still one more macaron left standing: Pierre Hermé’s Infinement Caramel. 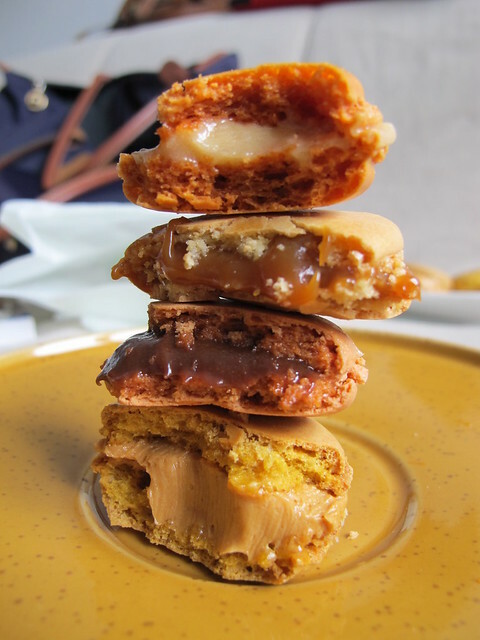 And Mr. Hermé doesn’t need the help of chocolate to make a fantastic caramel au beurre salé macaron. With the texture of whipped butter, the filling of this macaron is absolute perfection. There’s not one thing about it I would think to change. The sweetness is just right, the saltiness is right on the money and there’s a slight creaminess to it all that I think comes from the butter. And, as with most of PH’s macarons, the filling is laid on THICK (I mean, look at that bottom macaron! ), a fact that we should all be thankful for everyday. And so who wins it? Who makes the ultimate macaron? It was tough to choose, I even ate extra macarons to come to the decision, but in the end, I couldn’t. Pierre Hermé and La Maison du Chocolat tie for the best caramel au beurre salé in Paris. And so it ends, my very serious, very scientific search for the best macarons in Paris. But there will always be more patisseries and chocolatiers who will make more and more of these delicious little buttons for me to try and compare with the others. 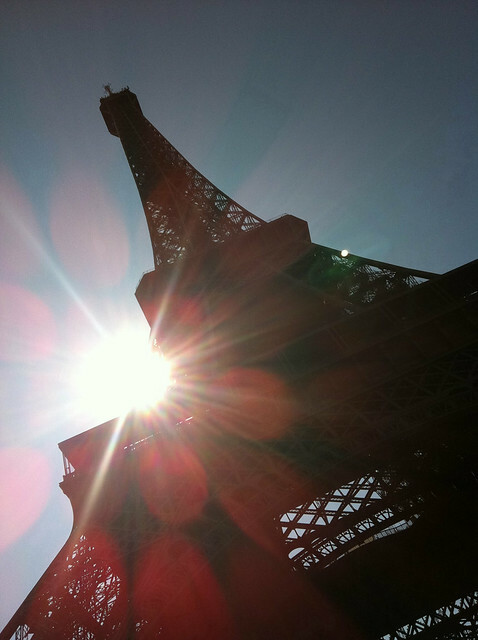 Hopefully, I’ll make it back to Paris to try them all (well, not all…). But if I don’t, Pierre Hermé, La Maison du Chocolat and Ladurée are only just a short flight away in Tokyo. And so here we are, part 2 of my taste-off, where I find the best vanilla and chocolate macarons in Paris. Like I said in part 1, I think these flavors can make or break a patisserie. If you don’t get vanilla or chocolate right, then what hope is there for other, more complicated flavors? But I’m not here to find out who among La Grande Épicerie, Ladurée, La Maison du Chocolat and Pierre Hermé got theirs right, it’s a given that their macarons would be good. I’m here to find out who among them made theirs better than everyone else’s. Ok, so I feel like I’m cheating here a little bit. I only have two contenders here, and La Maison du Chocolat’s vanilla macaron, as you can see above, is actually vanilla and chocolate. So why the too-short list? Well, La Grande Épicerie doesn’t really have a vanilla-only macaron. When I was there, the only macaron with vanilla that they had was the Kalamansi and Tahitian Vanilla one, and that obviously can’t compete in this category. 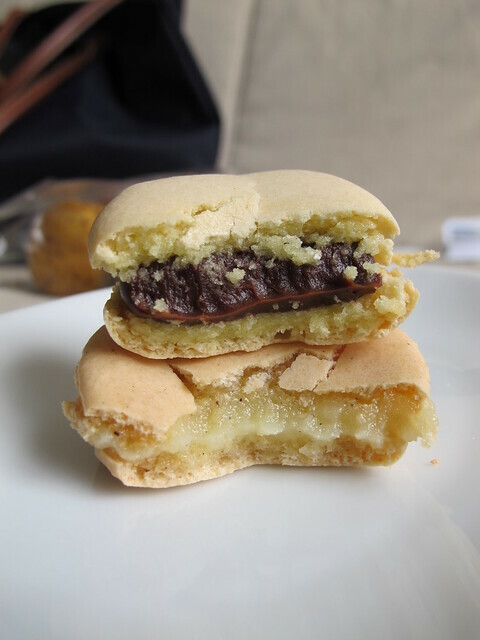 On the other hand, Pierre Hermé’s Macaron a l’Huile d’ Olive et Vanille, with an actual olive in the middle of it, is not something I’m willing to go through again… and so I’m left with the two above. And if I’m being totally objective, I’d be down to one contender, because La Maison du Chocolat’s is actually, in essence, a chocolate macaron, not a vanilla one. So, by default, the best vanilla macaron in Paris can be found in Ladurée. But that’s not to say Ladurée doesn’t deserve it. Their vanille macaron is delicious, not too sweet or overpowering but still distinctly vanilla, and not some vague, sweet, creamy flavor. So who’s to say that there’s a better vanilla macaron out there? This was tough. Really. I had to take multiple bites of the macarons because I really couldn’t decide which was better, and no, that’s not just an excuse to eat even more macarons. Like I need an excuse. In my opinion, these two are very similar. They even look the same, apart from the sprinkling of cocoa on the Pierre Hermé one. 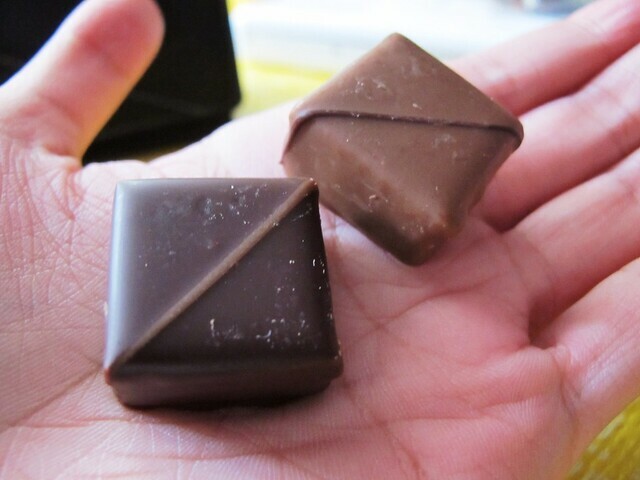 Both have fillings based on dark chocolate, not milk chocolate, so they’re less sweet, more chocolate-y. But one has a slight edge over the other, in that its flavor is slightly more intense, slightly richer and slightly more bitter. The differences are, in my opinion, very slight, but when you’re looking for the best of the best, the smallest differences matter. So who won this round by the slightest of margins? Pierre Hermé. And so, the grand dame and the bad boy of the Parisian patisserie scene each win one round in this battle. As it stands, it’s Pierre Hermé-2, Ladureé-2, La Grande Épicerie-1 and La Maison du Chocolat-0. But it’s not over yet. In the final part of this series, I saved the best flavor for last: Caramel and Salted Butter. Yuuuummmm. What’s a trip to Paris without sampling a truckload of few sweets? And while macarons and croissants are high on everyone’s lists (including mine) of things to eat while in the City of Light, one would be remiss not to try some chocolates from any of the world famous chocolatiers in Paris. And so, dutiful tourist that I am, I was happy to oblige and try some chocolate. But where to start? In a city of world class pastry chefs and chocolatiers, how do I choose what to try, which chocolatier to buy from? There’s Jean-Paul Hévin, Fouquet, Patrick Roger and more names that I can’t pronounce, all of them with a cult following, all of them world-class. I’d love to try them all, but not only would that cost me my life’s savings and health, it would also take me forever. Well, that’s where David Lebovitz, a blogger, chef and cookbook author living in Paris, came in. I came across a post of his entitled “10 Insanely Delicious Things You Shouldn’t Miss in Paris” (how can you ignore a title like that? ), and that list included La Maison du Chocolat’s Rigoletto Noir. A chocolate filled with a caramel mousse? SOLD! So when I came across the La Maison Du Chocolat store on Rue Francois 1er, I made a beeline for it, even if I just wolfed down some Ladurée macarons less than half an hour prior (more on that soon). My purchases? Rigoletto in both milk and dark chocolate and, because I couldn’t resist, more macarons. I got the chocolate (2 kinds), coffee-chocolate and the caramel-chocolate. Both chocolate macarons were delicious, but I would choose Ladurée’s dark chocolate over them any day. The coffee-chocolate was good, too, but I prefer my coffee full-on, so I’ll pass on this next time. But the caramel-chocolate. 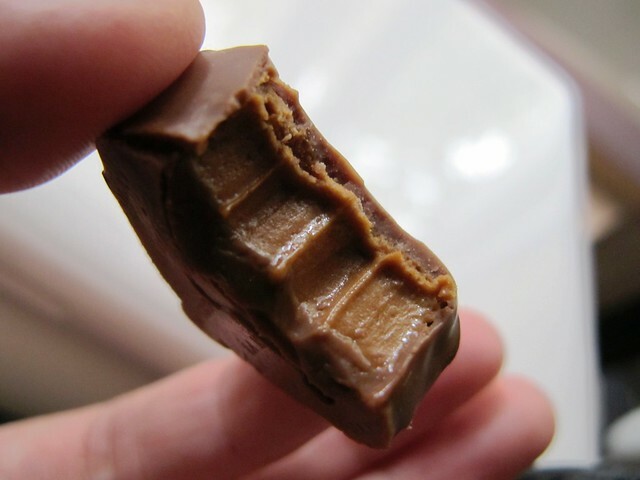 Oh, the caramel-chocolate. How do I even begin to describe it? It’s a salted caramel, with just the tiniest hint of chocolate ganache mixed in. It was bitter, salty, caramel-sweet and chocolate-sweet at the same time. I know the term “perfect balance” tends to be overused when describing contrasting flavors, but it really does accurately describe the filling of this macaron. Oh, Rigoletto macaron (its official name), we shall meet again. Soon. Like, tomorrow. There are no words, really. But as this is a blog post, I will try and verbalize how amazing these chocolates are… Remember what I said about the caramel macaron? Well, you can multiply that by… 74. I know I used numbers there rather than words, but I’m in finance and when words fail me, I let the numbers do the talking. But I’ll give it another go… The contrast of flavors, the silkiness of the caramel mousse, the perfect counterpoint of the salt or the bitter chocolate against all the sweetness, the creaminess of the chocolate… every single aspect of these one-inch wonders deserve a high praise, some sort of tribute to them. But since my mastery of the English language is letting me down completely, I will pay tribute to La Maison du Chocolat’s Rigoletto (macarons AND chocolate) in the next best way I know how… by high-tailing it back to the store tomorrow to buy more. All photos are owned by me, unless credited otherwise. If you want to use my images, kindly let me know and link back to this site. Don't worry, I don't bite. Comments are welcome, and even encouraged! But any rude, inappropriate, mean and disrespectful comments will not be published. Think of it as me trying to keep my site as pleasant an experience as possible for those who happen to stumble upon it.